Mr. Fowler started doing standup at 17 and moved to New York from Hyattsville, Md., about nine years ago. The Comedy Cellar was one of the first clubs to give him a regular slot. The scene near the Grand Street subway station. He cycled through some new-dad jokes. (His daughter, Thebe, was born three months ago.) “I’m more emotional now,” he said. “I cry during movies I never cried during. I cried during ‘Taken.’” Then he went into an extended bit about Whoopi Goldberg and her Japanese toilet. (“It was already warm. Which is disgusting.”) The audience laughed heartily. After his 10-minute routine, he loped upstairs to the comedian’s table and downed a few sips of a fruit juice blend, heavy on the maraschino cherries. Mr. Fowler doesn’t drink much, ever since an incident about five years ago outside a nearby 7-Eleven, when he and a couple of fellow comics were inebriated and got into a brawl with a group of men over a misunderstanding about a taxi. A brick was thrown, and they ran away before the police arrived. “After that, I was like, no more appletinis,” he said. He had more old friends to see, so he slipped into the Comedy Cellar’s sister club, the Fat Black Pussycat on nearby West Third Street, stopping to remind the bouncer, Steven King, that he’d ordered a bunch of Girl Scout cookies from his daughter and never received them. Mr. King, who chuckled when another bouncer greeted Mr. Fowler as “Sideshow Bob,” did not seem especially racked with guilt. 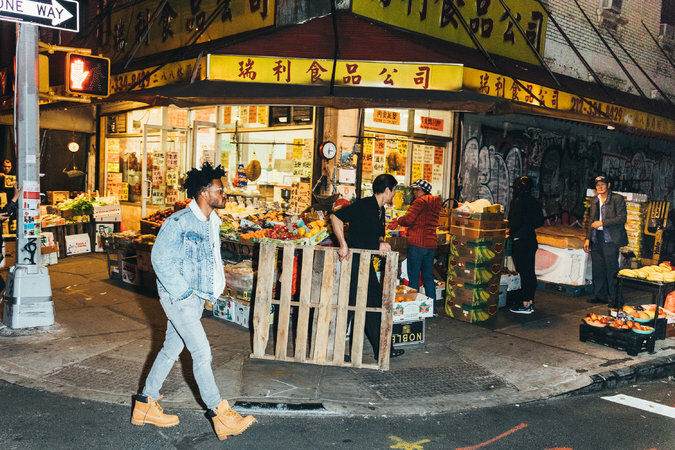 At about 9, Mr. Fowler received a text from a friend who was waiting for him at Vanessa’s Dumpling House on Eldridge Street. 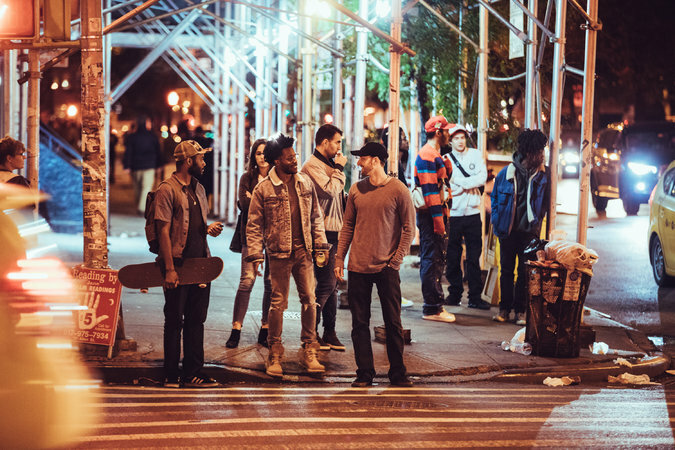 He hopped on the B train to Chinatown, where he greeted Eli Keneally, a former neighbor from the Bushwick section of Brooklyn with whom he used to play video games, and Zak Mohammed, a friend from his days working at the Times Square surf store Billabong. 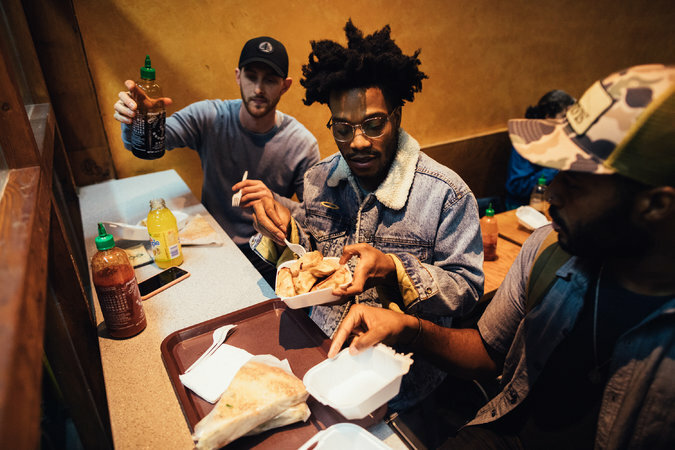 From left, Eli Keneally, Mr. Fowler and Zak Mohammed at Vanessa’s Dumpling House. They ordered fried dumplings, sesame pancakes and an orangeade. “The worst of the Snapples,” said Mr. Fowler, who was shocked to see that Vanessa’s now takes debit cards. Mr. Fowler showed off photos of his 3-month-old. Then the conversation turned to anime, bad action movies and whether Mr. Keneally should get a tattoo. There was more teasing about Mr. Fowler’s hair. The crew walked to the subway afterward. By the time the last crispy dumpling was downed, it was 11. A few years ago, Mr. Fowler would have made a night of it at Max Fish or Barcade. Now he wanted to head back to his hotel and rest for his Colbert appearance and the “Superior Donuts” Comedy Night gig at Carolines on Broadway after that. He headed out toward the subway, observing how much had changed. It hadn’t been that long since Mr. Fowler had lived in New York, but as he came to the corner of Broome Street, he lost his bearings. His friends tried to point him the wrong way, but he was on to them. They set off toward Union Square, passing graffiti that read, “Laugh Even When It’s Not Funny.” It was questionable advice. And as Mr. Fowler walked on, telling jokes about pizza that tasted like tomato paste and Ovenglow, no one needed to take it.